Today's bake is a miche made with home milled high extraction flour. I have been working on this for awhile, but ran into some problems with overheating the flour while milling, which led to some notable failures. Today, I was extra careful, and kept the flour cool throughout. The dough was very tacky at 73%, and seemed to lose its shape every time I turned my back on it. It held together enough to make bread though, so I declare it a success. The crust had that mottled look that only wet tacky doughs seem to get. And the crumb came out ok notwithstanding the mouse hole. We always seem to photograph slices, but what about the morsels we actually eat? I almost forgot to say something about the taste. This is very hearty, almost like an unenriched whole wheat loaf, but without the bite back of the bran. I sifted out around 1/3 of the bran, and used only the powdery flour and not the coarse farina. Altogether a very pleasant flavorful loaf. Mix flour, water, starter until just blended. Add salt, and mix (by hand) until blended plus a little more. the last two on the counter, the others in the bowl. Shape into boule and place in banneton. Proof for 1.5 hours until dough softens. * Golden flour is the part of the milled wheat that can get through an extra fine sieve. It is the part of the endosperm that mills to a fine powder (the inner core) plus tiny flecks of bran which gives it a golden color. With the technology I have available, I cannot separate out the bran from the powdery flour to get white flour as that requires use of controlled airflow which lifts out the lighter particles of bran from the heavier flour. The golden flour does not include the coarse meal from the outer endosperm aka farina. With multiple fine millings a lot of the farina can be crushed and so can pass through an extra fine sieve, but I didn't do that this time, and just took the flour that resulted from medium to coarse settings of my Komo. Yes, that's the same slice of bread as pictured above. Final question: Why is it that when I preview the post, I can see the formula table with borders around the cells, but when I post, the borders disappear? Any way to fix? Does this mean I have to get photo lights? Or, can it wait till after I get a mill? :-) Nice baking Varda and the lights really help too. I have to admit we have the AZ sun here that does the same thing - close enough. You are getting into the milling process with great results. Beautiful baking - great crumb too. Now, what is Golden in the formula? Beautiful bread Varda. I love the color of the crust and your nice open crumb. As far as the photos go I feel your pain. I've been able to shoot during the day using a tripod and a long exposure with good results. I tried using an old movie light once at night but wasn't crazy about te results. Yours came out very well lit. Do try the tri-pod. It allows for a long exposure without worrying about the amount of light. As long as I have a sliver of light it comes out great. I use the self-timer just to eliminate any possible camera shake. Every time I use this I remember that I'd meant to send you the idea after reading this bit of thread following your recent Golden Miche post. 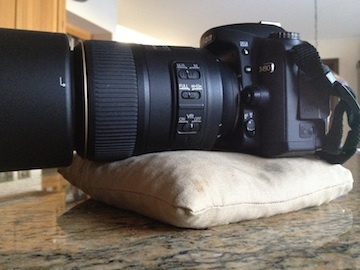 I picked up the bean bag tripod substitute idea when on photo safari in Africa many years ago. Lovely bread, Varda, with a bonus info on photography, too. :) What is 'Golden' in the main ingredients? Your home-milled flour? Beautiful cloth! It's really interesting because only a few weeks ago one of my friends showed me some textiles she bought in a street market in Accra. She's starting re-decorating a house soon and bought the fabric to make curtains, cushion covers, etc. The patterns are quite different from what your daughter bought for you, but the colours were just as bright and really lovely. What are you going to do with your cloth? I was just saying the the big mills use air flow to separate off bran. Not me. Khalid tried once with a hair dryer. Ok, I'll admit it. Even though Khalid's attempt was a fiasco which involved a lot of cleaning up, I tried it too. Not good. I think what I want is a centrifuge. As for the cloth, my daughter was in northern Ghana. She said that there were very few consumer goods to be had, but she did see a lot of cloth which people buy and make into clothing. She bought me one yard, specifically as a backdrop for my bread photos. She thought that the cloth was not made in Ghana but probably imported from Asia, and made specifically for the West African market. But she was only there for a month, and not an expert in export/import so who knows. Yes, there is a bug with the tag filtering running here. I just made a change that made the border show up on this post. Floyd, Thanks for the fix. hi varda, love the bread. hi varda, love the bread. hard work for a good bite! so worth it. thanks for sharing. about this overheatingand the troubles you had. I'm ashamed to say that in my "single thread" life I've been working on lamination - so I haven't been pushing the milling. Of course with the hand mill, I can't crank enough to ever overheat, but I would have supposed with the Komo it still would be difficult. So, I'm curious about what you did. Did you dough seem to be ok immediately after the mix and then go slack? That's one symptom of excessive starch damage - which again, I would not think particularly possible with the Komo. I'm working my way through the very dense "Wheat Flour Milling" book and my head spins with the number of factors about how the wheat itself is treated that can influence the final loaf. And I haven't even gotten past the cleaning and storage processes! Nice bread. Still curious about the milling issues you are having. It is very easy to overcook flour in a Komo. Shortly before I did it, I saw this thoughtful reply from Yerffej to a post from Linder - first comment down - so I was forewarned. But I didn't pay attention. And I ended up tossing the loaf out back for the coyotes. I have been separating my milled wheat into three components which I call golden, coarse, and bran. In the past, I'd do a sequence of increasingly fine millings separated by sifting in a #55. Each time, some of the golden flour would pass through the sieve, but to get more, I had to mill the leavings a little finer. So I thought, why not just mill the whole thing fine, and skip all the extra work. So I did, and I was able to shave off a half hour while getting a pretty good yield of the golden flour. But as with many shortcuts, the result was very sad. The initial symptom was exactly as you say. The dough would behave very well, and then suddenly very badly, slackening without warning. And the final loaf had big nasty holes, and compacted crumb. Ptui. It took me awhile to figure out what had happened, but I was able to because I have had this experience before, when trying to get a good result with 100% atta durum loaves. Andy was the one who pointed out (after my third attempt or so) that it was probably a flour issue and due to starch damage. I have been doing some reading as well - more of the web grazing variety. It seems that after separating the bran and germ out, the commercial mills go through a sequence of milling steps where they first pull off the patent flour (easily powdered inside of the endosperm.) Then roll through the remainder and pull off subsequent layers - first and second clear flour. The second clear flour gets steered off for animal feed, and the first clear is used as a protein enhancer mix in (plus a small amount sold directly by King Arthur.) They end up recovering 75% of the berry for white flour presumably not including the bran, germ, and second clear. I on the other hand, start with a berry and end up with something like 10% bran, 65% golden, 25% coarse where coarse is a mix of farina, bran, germ and golden is a mix of let's call it white flour and bran. No matter how much milling I do, I can't get more than 65% to go through my finest sieve and of that a few percentage points are fine bran. The endosperm is something like 82% of the berry, but I don't know percentages of patent, first clear, and second clear. I also don't know if there is a hard line between these categories on some sort of physical level, or if the categories are a function of the milling process. The answers to these questions would help me somehow or other. Maybe I just want to know. Ok. Probably more than you have time for given the demands of work and lamination. I was very happy to see you checking in. Hope to hear more from you on this subject or any other. I do know that part of the reason for tempering wheat is to get the endosperm to powder better. I also know as you get closer to the bran the protein content increases (but protein quality in terms of how the flour acts in the dough and through the fermentation process goes down) and the ash content increases. I need to check (again) but would speculate that this is a function of the composition of the wheat berry itself and will vary with the batch of wheat. The protein and ash could be measured by a lab to see if the various mill streams were running to spec (if that's what you were asking...) - but I haven't gotten to that part of my book, yet. After reading your referenced thread I'm now very curious. I can get down to "silk" with the Diamant. My finest sieve is 100 mesh (and I even get some bran through that), but even before that the flour looses its gritty feel even when it is chock full of bran. Actually, I can get almost pure bran down to "silk." The Diamant is steel burrs. I wonder if they really make that much difference. So much time - so little to do. No, wait, strike that - reverse it! I was referring to Linder's post. Patent flours have the streams with high bran content removed and are always less than 72%. They vary from between 65% for long patent and 45% for short patent. Clear flour is composed of the streams that are between 65 and 72% extraction. Pat, This is exactly what I was looking for. Thanks so much. So one more question: what is flour X? Is it properly called Farina? As for your question can I mill all the flour down to powder leaving the bran - I haven't been able to, although I admit that I get very tired when the streams fall like snow flurries rather than driving rain, and I generally quit while there is still a bit coming through the sieve. If my breakout above is correct, then I ought to be able to sift all of the clear flour out of the coarse flour, or bring down the coarse flour by about a third. That is unless second clear flour is too coarse to go through. I understand it's used for animal food, so may not be very fine. (And yes, the brain is foggy - because I can't read your chart and I read charts like this all the time...) calls Flour X "Shorts and bran" - which sounds like a particularly manly breakfast cereal to me. the crumb has similarities with what I achieve with my local Gilchesters' Farmhouse flour. wow, wow and wow!! so much information to absorb and learn. i am not lucky enough to own a home flour grinding mill. i really envy what you do here varda, beautiful result. thank you for sharing and all the bloggers who graciously put in more useful information!! You've done an outstanding job keeping us up to date on the ins and outs of home milling. Thanks for your posts. Just out of curiosity, how do the particular varieties of wheat that you have available affect the color and the behavior of your doughs? Oh, and the indirect lighting technique is a great photo tip.